This modern two bedroom apartment is situated in a stylish development close to the historic town of Elche, on Costa Blanca's coastline. The stylish apartment boasts a fresh, contemporary decor. This cosy four bedroom holiday home is fantastically equipped for a relaxing family holiday. It boasts a very homely open-plan kitchen and living area and four comfortable bedrooms. Outside. This beautiful luxury residence "Infinity View" is unique on the Costa Blanca and has fantastic views and communal areas. 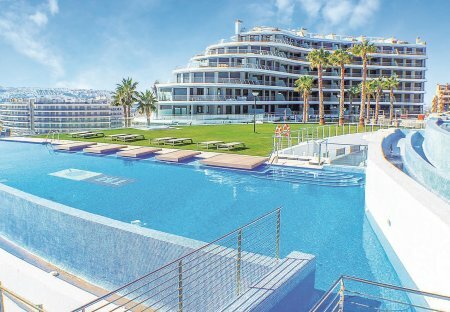 This luxurious holiday apartment lies in one of the most exclusive resorts in Arenales del Sol and on the Costa Blanca, just 350 m from idyllic sandy beaches. The complex has three Jacuzzis. Located in Arenales del Sol on the Costa Blanca, this beautiful semi-detached holiday home is just 300 meters from the beautiful beach. The urbanization, in which the house is located. Charming and bright holiday apartment in a calm private estate with modern homes and a large communal pool. It is located in El Pinet-La Marina, approximately 800 m from the beach. AIR CON Spacious 1 bedroom apartment with English TV and Wifi in a secure complex in San Miguel De Salinas providing very competitively priced holiday accommodation. In Arenales del Sol, this cozy holiday terraced house is located in a private urbanization with community pool. Here you will find sometimes the most beautiful fine sandy beaches of the coast. This beautiful luxury apartment "Infinity View" is unique on the Costa Blanca and has spectacular views and fantastic communal areas. This beautiful holiday terraced house in La Marina on the Costa Blanca has access to a communal pool and is located very close to the beach. With excellent facilities. This 2 bedroom villa with shared pool is located in is located in Elche and sleeps 5 people. It has a garden, barbeque facilities and parking nearby. The villa is near golf. This 2 bedroom villa with swimming pool is located in Los Arenales del Sol and sleeps 4 people. It has barbeque facilities. Overlooking the sandy beach of Arenales del Sol.